I'm back, not much can be done while in an aeroplane. I was thinking once all my Tilapia grown up they will require bigger space and more water . My current installation is like these below with single 100 gallon tank holding all fish. 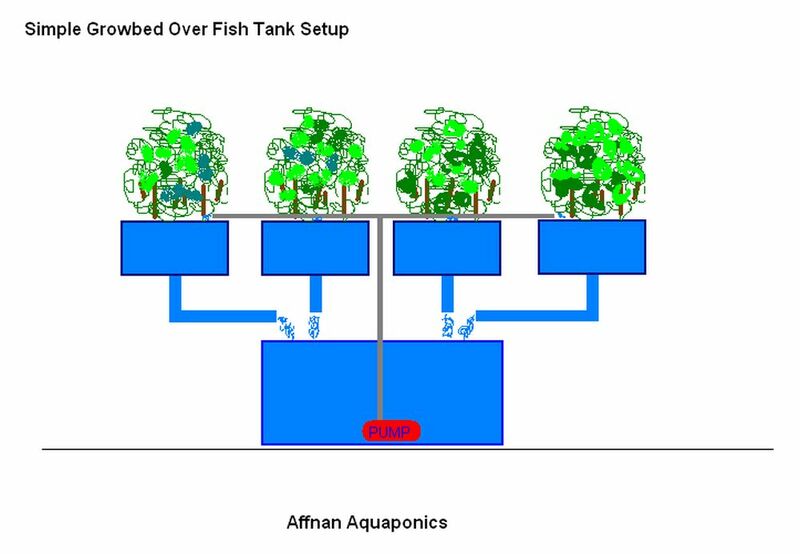 Also as sketch below, as water are use up during dry spell I will need to constantly monitor water level in the fish tank and since its at the maximum allowable for this setup its easy to overlook and dangerous water level may occur where it would be less than 50% of full capacity. Furthermore I'm thinking of possibly putting additional growbed and having more fish on the area that I am currently having. 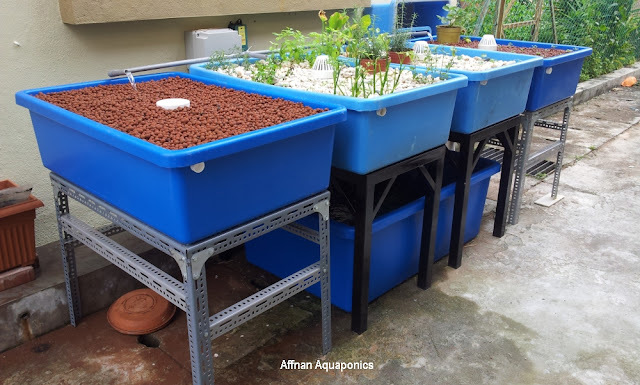 CHOPS is one good way of increasing fish area, but in my setup it will take growbed space which I don't have much and the tank for CHOPS will need to be taller or raised above growbed height. This I find difficult for my installation. So to have a clean and modular set up, I am trying this idea where additional fish tank are use as return tank and having an overflow from this tank to my existing tank. In this arrangement a Constant water level can be obtain in the return tank and overflowing into the feeder tank where a pump is located to redistribute water to growbeds. Since I have unused space below the growbed, putting additional fish tank of same size is not that difficult to do and its will be less obvious to the surrounding. There are space for two additional growbed and fish tank in the back lane. My setup already loaded and running it will takes some time to redo I will try adding one fish tank first and divert two or three of the growbed return into this tank. One pump is all that is needed for this setup if you have a large enough pump or as my current installation is using two smaller pump it will do with minimum of changes. Existing fish tank become feeder tank and no changes to it except holes needed to be made for water overflowing from Return Tank. 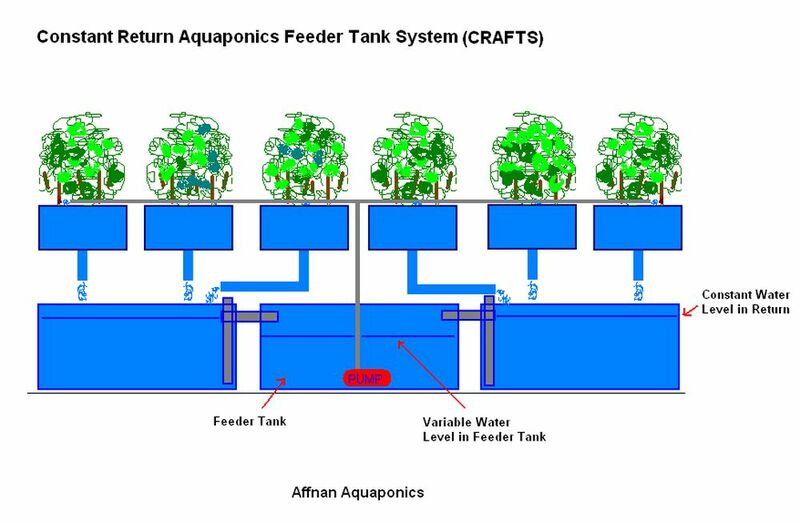 I call this Constant Return Aquaponics Feeder Tank System (CRAFTS) because the water in Return Tank is Constant Level and it make use of a Feeder Tank for water feed. I think this setup can be made modular and grow as we need more growbed and fish rearing area. Imagine having a circular Feeder Tank and having Growbed and Return Tank with fish as satellite around it. Its only a two hour forty minutes flight. Woah... I love your setup! I wish I have so much space in my backyard. I have a question though: How do u catch the fish once they've grown big? Since the fish tank is right under the growbeds. Good question, its still has enough space to get a net in. I need to experience that once the fishes come to that time. 3" terlalu rendah minimum yg saya boleh rekomend ialah 8", 12" sebaik nya. Untuk Nursery bed boleh serendah 6" tetapi ini cuma untuk semaian sahaja.